It’s ironic that when our economy finally developed a head of steam after many false starts, the sky fell in, as crony deals like the spectrum and land allocation scandals unravelled. A sizeable transformation of upwardly mobile consumption powered the transition from a laggard to global front runner, despite misgovernance. Now, the legacy of poor infrastructure, scams and an “Indian spring” – with many valid anti-corruption demands but impractical solutions – threatens to derail stability, severely damping productive activity. This jeopardises the very basis of our economic momentum: a burgeoning market. Assorted blunders add to the chaos, eg, judicial rulings that contravene the sanctity of contracts, and misguided institutional action, like the Reserve Bank of India ( RBI) trying to force the government towards fiscal responsibility instead of concentrating on providing stability and support for growth. This is aggravated by a government that does not seem to act in the public interest, and a frustrated Opposition that stalls governance and parliamentary proceedings. The result is a marked inability, or unwillingness, or both, to act rationally and comprehensively on forward-looking, achievement-oriented plans — except to tide over crises, stay in power somehow, and capture the treasury for opportunistic ends. The Empowered Group of Minister’s ( EGoM’s) decision last week to merely reduce the 1800 MHz spectrum reserve price by 30 per cent where there were no bids is a good example. To see why, compare the end results that would best serve our common interests with the consequences of the government’s approach and actions. Our inflation is driven by increasing fuel and high-technology imports, with rising oil and coal prices and structural constraints on capacity and productivity — aside from expanding demand as purchasing power increases. (There’s also the import of gold, of course, possibly fuelled by lacklustre financial alternatives.) 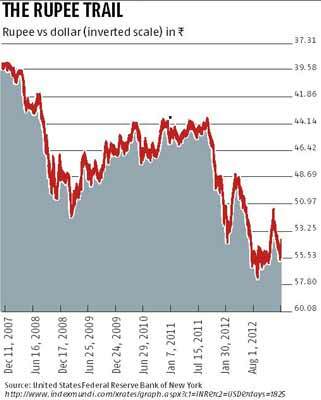 This shows up in a steadily depreciating rupee after August 2011, falling 25 percent from Rs 44 per dollar to Rs 55. Likewise, structural supply constraints remain intractable in the absence of increases in production. Increasing supply involves improving entire process chains: extension services and inputs for agriculture, market organisation and logistics, even changes to cropping methods such as alternatives to flooding rice fields. In other words, deep and sweeping changes in areas where we have not achieved them so far. The requirements for productivity improvement, likewise, are improved infrastructure such as communications services, power supply, storage and delivery including logistics and transportation — again, areas of weakness and inability to deliver that are mired in a policy stalemate, such as in power supply and telecom. The EGoM’s decisions on spectrum policy have major implications for productivity and user services for everyone, apart from the operators. Communications services are a basic enabler for effectiveness and efficiency. Increases in supply are facilitated once the infrastructure is in place. For this, we need supportive policies and incentives. Our spectrum allocation approach does not serve these purposes, because the growth in the sector has been largely of voice services and the delivery has been skewed in favour of remunerative urban areas while rural areas have insufficient coverage. This is partly the consequence of allocating narrow bands of spectrum that suffice for voice services but are inadequate for data delivery, and partly because of costs.